The BMW Pininfarina Gran Lusso Coupé has made its official debut – the car premiered at the latest edition of the Concorso d’Eleganza Villa d’Este in Lake Como over the weekend. The four-seater luxury coupé exhibits typical BMW proportions (a long wheelbase, stretched bonnet and set-back greenhouse), allied to Pininfarina-based elements that lend it added flair. Lots of flowing lines and contours, with the Hofmeister kink at hand, replete with a V12 logo sitting behind it. Visual elements include a slender, flowing tail light design set within high-grade trim in matt-sheen aluminium. A particular highlight is their open design, allowing air to flow through them. Also to be seen are freestanding B-pillars; when viewed from the outside the visual impression is of a homogeneous glazed area and frameless doors that appear very light. Based on the 7-Series platform, the Gran Lusso Coupé sits on exclusively designed five triple-spoke 21-inch wheels finished in a mix of matt-sheen aluminium, black and black chrome. A V12 powerplant resides underneath the bonnet, though no specific details are mentioned – presumably, it’s the same 535 hp 6.0 litre twin-turbocharged unit as found in the 760Li. 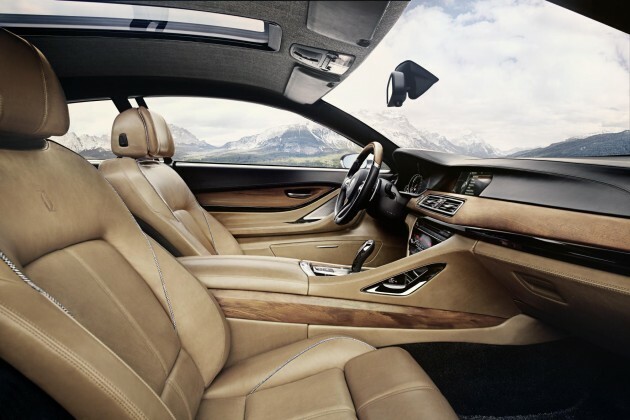 The interior is where the plush is – an evolution of the 7-Series interior, the cabin features a special colour concept and choice materials, among other things. There’s high-grade leather from the Foglizzo leather factory – in black and a light shade of Tobacco Brown – contrasting with metal highlights in black chrome, for starters. Also to be found, kauri wood from New Zealand – here, a single piece of wood is selected by the Italian timber experts of Riva 1920 exclusively for the car. Kauri wood has a unique grain and shifts in colour from gold to red to brown, depending on the incidence of light and angle of view, and in this case is simply polished and oiled. Other bits include a roof liner fabricated from fine Italian virgin wool in a grey plaid “Principe di Galles” pattern. The brown leather seats also pick up on the pattern in their all-round piping. 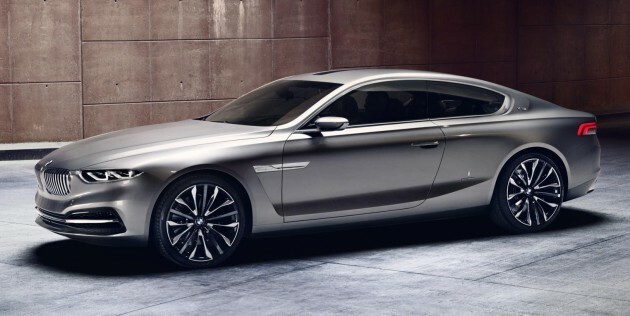 Is this the precursor to the return of a fresh 8 Series flagship coupe in the future then? The shark will be attacking our shore soon. why this car look so sad??? BTW, I think Panamera is better. Gorgeous. much betty look than Panamera! Is it just me or the kidney grills looks too big in proportion to the slim headlamps? this is like tall amd handsome guy but with enormous nostrils. Designer 1: I loved the BMW design. Designer 2: But Aston Martin’s design looks classier. Chief Designer: Why not both? Italian this and Italian that…might as well buy a Maserati Granturismo Sport or Ferrari then. Why buy a German that pretends to be Italian? BMW’s really losing the plot these days. As a longtime fan and owner its a real disappointment. This car make Panamera look like an AH PEK. Aaaaa Bella!! IMHO the most beautiful BMW ever…. The car is too long and too luxury to become a sorts GT like the 8 series . pendek sikit je.